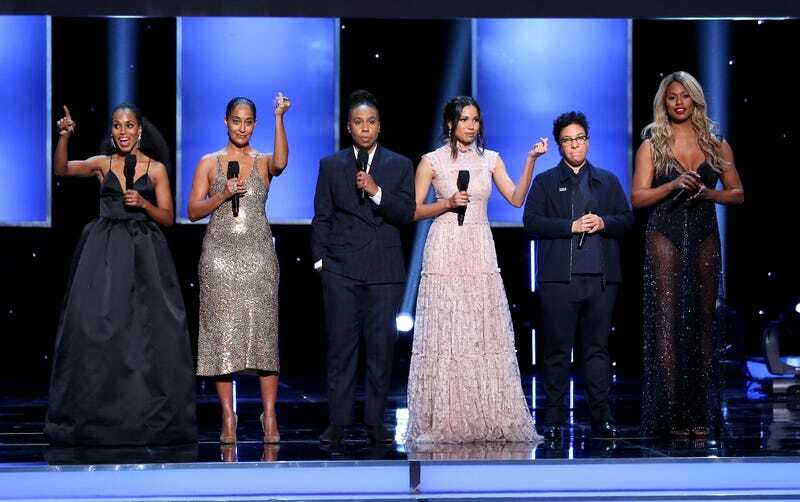 Every year, black excellence is celebrated at the NAACP Image Awards, and during Monday night’s airing of the 49th annual event, held at the Civic Auditorium in Pasadena, Calif., Ava DuVernay took home the Entertainer of the Year Award. During DuVernay’s acceptance speech, she mentioned her fellow black creatives such as Ryan Coogler, Kenya Barris and Shonda Rhimes. With all eyes on the #MeToo and Time’s Up movements, Laverne Cox, Kerry Washington, Tracee Ellis Ross, Jurnee Smollett-Bell, Lena Waithe and Angela Robinson issued a call to everyone to pledge their support for Time’s Up and urged people to head to the polls. “Then we have the ability to shift the imbalance of power,” Smollett-Bell said. Of course, with Anthony Anderson hosting, his monologue included jokes directed at the White House, and he took a stab at Omarosa Manigault Newman. But he wasn’t the only one who expressed contempt. During Will Packer’s acceptance speech for the outstanding film award, which, of course, went to Girls Trip, the director referenced Donald Trump’s “shithole” comments. Other winners of the night included the film Get Out, which won for Outstanding Actor in a Motion Picture for star Daniel Kaluuya, and writing and directing awards for Jordan Peele. “I don’t think you’re allowed to beat Denzel Washington in acting competitions,” Kaluuya said during his acceptance speech. Among the winners in TV categories were Power, Insecure, Scandal and Black-ish, which won five awards, including outstanding comedy series.